Numa Pompilius, after defeating the Italic Sabines in Rome, decided he and his Etruscans were going to settle the area to show their superiority. Most of the temples and shrines on the southern hilltop of the Capitoline Hill were destroyed so as to make room for the massive Temple of Jupiter Optimus Maximus, which was to be visible from all the hills in the entire city. Construction began under the first king of the Etruscan dynasty, Tarquinius Priscus during early 6th Century BC. Nothing is mentioned in written records about progress under the second king, Servius Tullius. Tarquinius Superbus picked up the project again during his reign as the third king, but was interrupted by the death of his father. He was not able to finish the project before he was banished from Rome, ending the Etruscan dynasty. The temple was finished and dedicated under the newly formed Roman Republic, under consul Marcus Horatius Pulvillus, on September 13, 509 BC. As was typical in Etruscan-Italic design, the temple had three inner chamber sections, separated by walls, all under one roof. The inner chambers were for Juno on the left, Minerva on the right and Jupiter Optimus Maximus in the center. 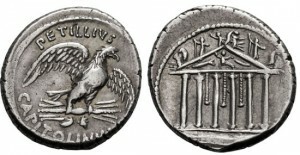 According to historian L. Calpurnius Piso, the cost of the project was 40,000 talents of silver, but another source, Fabius Pictor, clarified the total as 400 talents of silver, the equivalent to 40,000 pounds and was the amount cited later by Livy and Plutarch. The temple itself was of araeostylis construction – widely spaced columns which were eight times higher than the diameter of their shafts. This made the temple look low and wide. It was built on a podium and the perimeter was almost 800 feet. Each side was nearly 200 feet and had triple rows of columns on the two sides and the southern façade. The acroteria featured a terracotta quadriga driven by Jupiter, the artist being Vulcan of Veii. It would remain there until replaced in 296 BC by a bronze version created by the Ogulnii brothers. A clay statue of the nocturnal thunder god, Summanus, counterpart to Jupiter being the god of diurnal thunder, was also part of the acroteria scene and ironically struck by lightning in 275 BC. The head of the statue was found in the Tiber River. Apart from some other random accounts, not much was written, or at lest preserved, about the temple from the early Republican period. From 459 BC on, entire series were written about dedications and honoria that happened in the temple. Beginning in 366 BC and every year afterwards, on the Ludi Romani, a large procession took place which began from the Capitoline area. The temple remained in use and basically unchanged for centuries, with the exception of paving the inner chambers in 149 BC and gilding the bronze lining of the roof tiles. On July 6, 83 BC, a widespread fire in Rome completely destroyed the temple. Lucius Cornelius Sulla Felix (more commonly, Sulla) immediately began reconstruction and it was completed and rededicated in 69 BC by Quintus Lutatius Catulus. The temple was destroyed by fire again during the civil wars of 69 AD and once more in 80 AD. The last time the temple was dedicated was in 425 AD and was still admired as one of the greatest architectural works in the world. The Vandals plundered it during their victory over the Romans and the temple has been lost to time with very little remaining today. M. Volteius M.f. AR Denarius, VF+, SCARCE, Temple of Jupiter Capitoline, 78/75 B.C.E. PETILLIUS CAPITOLINUS. 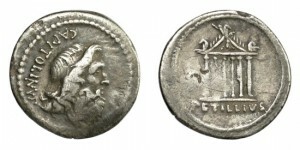 Denarius, Rome, 43 BC. Rare, VF.